It’s difficult to imagine what sort of response Marvel expected when it announced a partnership with Northrop Grumman, the fifth largest defense contractor in the world. But the publisher’s decision to axe the deal following a swift wave of backlash suggests that it didn’t anticipate people being turned off. The story was intended to be the sort of promotional, explicitly-branded tie-in that you see in comics all the time. Mars, for instance, has worked with Marvel in the past to advertise M&Ms by having their characters team up with Iron Man. Obviously, though, there’s a very big difference between advertising candy and advertising missiles, one of Northrop Grumman’s more widely-known products. The optics of the partnership were obviously bad enough that Marvel felt it’d be better off without, but what’s remained unclear was just how bad (or harmless) the comic actually was. Thanks to an anonymous tipster, we got our hands on the first issue and it’s... a comic promoting a defense contractor. If you’ve ever read a tie-in comic before, it’s par for the course: it includes a team of tie-in characters getting to upstage the famous superheroes who guest-star, a barely-there plot, and awkward and clumsy writing. It’s just got an extra layer of awkwardness, since the thing being promoted in it is a defense contractor. The cover was previously released, but it’s worth noting that it shows five very recognizable characters associated with the Avengers (Vision, Ant-Man, Nick Fury, Captain America, and Iron Man) teaming up with the Northrop Grumman Elite Nexus (N.G.E.N., pronounced “engine”). The Avengers look very much like they do in the movies, which would definitely catch the eye of more than just comic book fans. In particular, the Vision is clearly rendered to look much more like the version that appears in the Marvel’s recent films. The choice stands out because, of all the characters presented in the book, Vision is the most in line with the idea of the advanced artificial intelligence that Northrop Grumman is showcasing. Meanwhile, each member of the N.G.E.N. is introduced as a Northrop Grumman recruit with a vastly different background who develops a different technical skill set as a result of their work with the organization. Woo’s report recounts how, under Fury’s supervision, the Avengers were unable to subdue Red Ronin despite using a number of different techniques to shut the robot down. Even though Ant-Man is eventually able to make his way into Red Ronin’s hull, it’s unclear whether he’ll have any more success from within. Iron Man and Vision—the two technologically advanced members on this particular Avengers squad—seem to be only able to punch the robot, which has no effect. Fury informs Captain America that if the Avengers aren’t able to stop Red Ronin, S.H.I.E.L.D.’s only option at that point is to drop a nuclear bomb on the robot. Captain America insists that that isn’t an option and instead calls up the Department of Defense on a secure communication channel. It’s weird to think that the DoD would have more options, technology-wise, than the ultra-futuristic S.H.I.E.L.D., but the point is to valorize Northrop Grumman’s contributions, which go through the DoD. As Woo narrates the ordeal from some undetermined point in the future, she explains that, because Red Ronin was not actually being piloted by anyone at the time, her team was the only option left available to the Avengers. The whole book is incredibly dense in its explanation of what’s going on, a natural (and understandable) story taking a backseat to the tie-in between the famous heroes and the people who work for Northrop Grumman. The Avengers determine that it’s almost impossible for them to shut off the signal powering the robot, and as Vision and Iron Man struggle to physically fend the robot off, Captain America confirms that the Avengers need the N.G.E.N.’s assistance. Note how the narration boxes above continually mention N.G.E.N., all the work they do and how that makes them the best possible people for literal superheroes to call. One of the boxes explains what N.G.E.N. does. It’s described as a research group working to perfect the “merger of the human mind with artificial intelligence,” which focuses the comics connection to Northrop Grumman on that kind of science, rather than, say, their missile guidance systems that make for better war. Comic book wise, this means that each member of the group is located in a different part of the world, they are able to mentally link up with one another by using an “interlink pod” that routes their consciousness into an AI-powered fighter jet. Again, the connection here is between superheroes and the company, positing that working for Northrop Grumman is cool and heroic—so heroic that they can help where the Avengers fail. Together, the N.G.E.N. team is able to form a gestalt consciousness that’s built around the artificial intelligence that powers the Synapse-4, their remote-controlled fighter jet. The backgrounds of the N.G.E.N. members are, in a way, prototypical hero backgrounds—the reformed hacker in particular—with a dash of things that are noble—like being an educator. These noble ambitions naturally find their best outlet through the patronage of Northrop Grumman. What follows is a discussion of how to stop Ronin by locking up its legs and the electromagnetic pulse-like weapon it has access to. Though this comic is ostensibly meant to be for all ages, the explanations for the science being used here are dense. In fact, the whole story is dense, which makes one wonder if it would even be effective in promoting the work of the company. While there is a definite propagandistic edge to the whole thing, it’s clumsy, weirdly written propaganda. As Red Ronin prepares to detonate, Iron Man and Vision’s systems both begin to malfunction, paving the way for N.G.E.N. to come to the rescue by absorbing the energy with their brains. A running theme of this book is how lost the Avenger characters would be without the special expertise of the N.G.E.N. It’s a very easy ploy to spot: everyone knows the Avengers save the world, so if the N.G.E.N. does what they can’t, Northrop Grumman must be even better. Red Ronin begins to unleash its attack and the N.G.E.N. all liken the sensation of ingesting and deflecting the robot’s signals to listening to the entire world scream at the top of its lungs in unison. The experience nearly kills them. 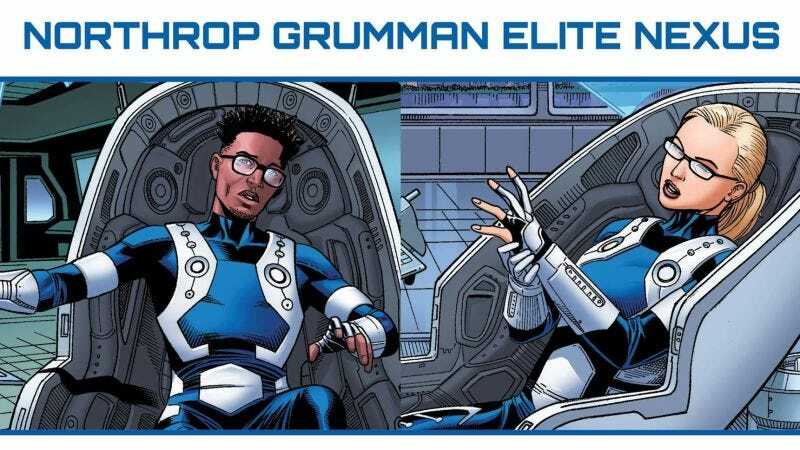 Near self-sacrificing heroics are another commonly used manipulation in fiction, but the Northrop Grumman branding makes it more cynical than when it’s used in a regular superhero comic. But of course, the effects are only temporary, and the members of N.G.E.N. do eventually wake up, ready to fight again in a second issue never to come. Apparently they would have faced Ultron. At the same time, though, the issue ends with a very direct call to action for a now-canceled sweepstakes to be drawn into the next installment of the story. Throughout the entire issue, there are numbers and letters hidden within the illustrations that spell out a password that would have unlocked Marvel’s official Avengers/N.G.E.N. website, where readers could have entered the contest. “Want to join the adventure?” is clearly meant to entice readers into considering a future in which they join Northrop Grumman to become people like N.G.E.N. operatives, which is weird to see in a book that was meant to be given away to kids at a comic book convention. And we end like we began, with another ad juxtaposing Northrop Grumman with comic books. Northrop Grumman’s headquarters are, according to this, the closest reality gets to Stark Tower. As a story, the Avengers’ team-up with Northop Grumman reads like—again—promotion for a defense contractor. The actual superheroes are noticeably inept at their jobs and the N.G.E.N. folks are made out to be larger than life figures that readers are supposed to see as aspirational. It’s unclear just how much of the comic’s science is grounded in reality and, at times, the book’s writing is so full of jargon that it’s difficult to imagine that the book’s for anyone except those who might have already been considering work in Northrop Grumman’s line of business. You could make the argument that Northrop Grumman is simply doing what all other companies do when they pay for branded tie-in comics: advertising themselves to as wide an audience as possible. But the key difference between this comic and others is that it isn’t making a good faith effort to be entirely transparent about what Northrop Grumman sells or stands for. This is a comic book for children that is marketing a company that produces weapons of war. It’s difficult to see how either Marvel or Northrop Grumman thought this was at all appropriate.